2. It might be possible that some of you know about it, however I thought it to share with you all. It might help to some. 3. There are many open groups on Facebook with millions of members, you have to join them. After joining them, you can post your Fan page URL, Website URL, Blog URL or Product URL to get unique, live and instant traffic. 4. The best part is this, that you will get Facebook groups on every niche, so join the group which is related to your site or blog. 5. 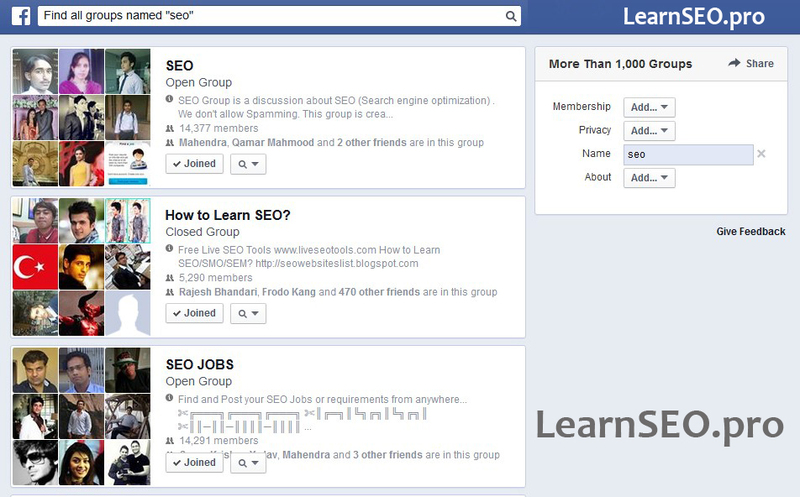 How to join Facebook groups? Example: If your website is related to SEO. Then you just have to type Find all groups named "seo" in the search bar. See below screenshot for more clarifications. I have collected some active and open Facebook groups, where you can promote any site, Join these and get viral on Facebook. The Easiest Method Ever to get traffic to your website, blog or product for Free.